When we make Kimonos, we use units called “shaku” and “sun” to express their size. These are Japanese traditional units and this measuring method is called “Shakkan-ho.” However, metric unit is now widely used in Japan so in most cases, artisans or makers convert the sizes measured in centimeter to shaku and sun. In fact, there are two systems for shaku and sun. When making a Kimono, we use a system called “Kujira-jaku.” Although 1 sun equals 3cm and 1 shaku equals 30cm in general, these are from another system called “Kane-jaku” which is used for architecture. In terms of Kujira-jaku, 1 sun is about 3.8cm, and 1 shaku is approximately 38cm. As Kimonos have existed before introduction of metric units, sizes of all rolls of Kimono fabric and measurement method for people are based on Shakkan-ho. Since Shakkan-ho and metric units are indivisible each other, we still use Kujira-jaku in Kimono industry. There are some stores display Kimonos with their size using Shakkan-ho. What “to correct someone’s shape” means is as follows. Before wearing Kimono, we usually correct our shape. People may be asked to bring some towels when they go to a Kimono-dresser for coming-of-age ceremony. As Kimono has a straight line in its shape, it will get wrinkled or moved when someone has large hip-to-waist ratio or waist-to-bust ratio wears it. To solve such problems, she first has to make her shape as straight as possible. We have some special tools but in general, some towels and handkerchiefs are enough to correct your shape. The waistline is made less visible by wrapping the waist with a towel, and a handkerchief is used to fill the loose neckline. People with large chests use towels around their chests to secure them. We don’t tighten the chest as much like old days when the large chests were tightly fastened by towels until their chests were flattened. 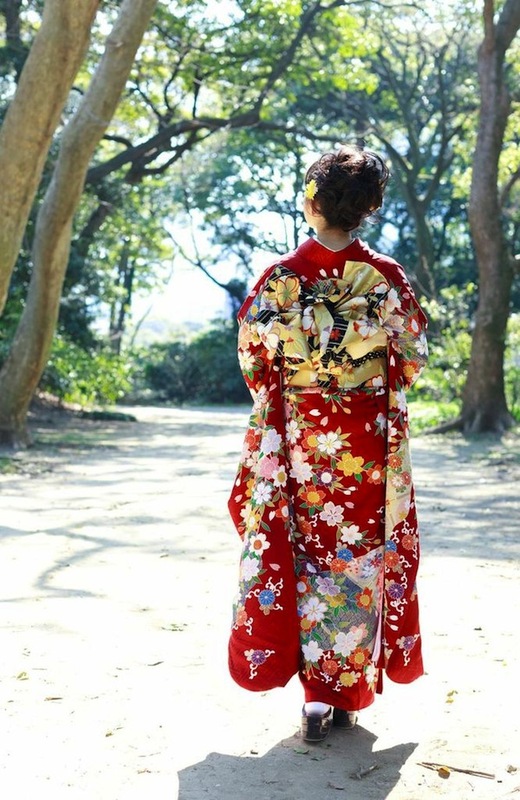 Like furisode (long-sleeved kimono) used for formal events, especially when you want to take beautiful photos of you in it, are adjusted more properly, but it is more common now to adjust it lightly. There are some people who don’t even adjust them at all. However, you should wrap a towel around your waist as it will help preventing slipping, and also help soaking up sweat. Kimono will give you long use as long as you dry it in the sun once in a year. This work is called “Mushiboshi”. You air clothes in order to prevent mildew including chrysalises and eggs and to remove moisture. This work is conducted normally in the dry season. We aired clothing in the dog-days in the old days. However, in this season, the weather is unsettled and very humid. Therefore, though it depends on the regions, winter is suitable to conduct mushiboshi. 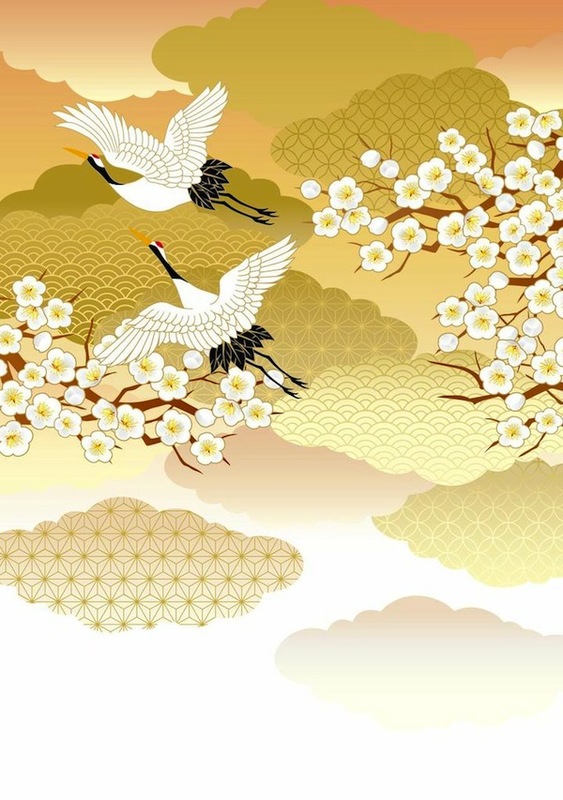 When you air kimono, it is much better to air it within doors, or kimono would be weathered by the sun and wind, so pecial care should be taken on this point. 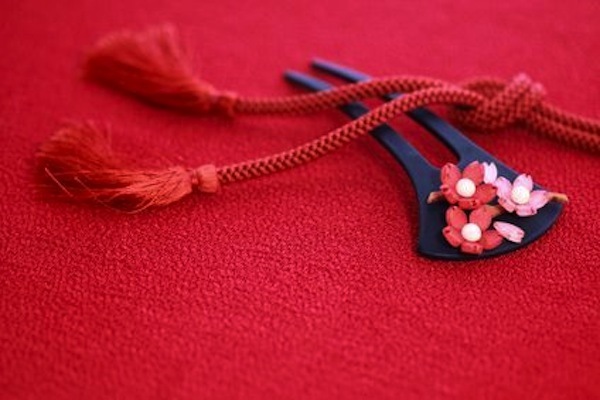 If possible, it might be better to use a bomboo hanger on which to hang kimono one by one. If you have no enough room, it also works to open wrapping paper and put kimono with folded. And do not forget to check if there is any worm-eaten peaches or not before you tidy it up. You can air it for four hours arund noon. If you can not do it nohow, you also can leave the closet open and ventilate there. You need not to conduct mushiboshi the kimono which you often wear as long as you dry it soon after you use it. Kimono are wrapped in a large piece of paper when storing kimono. This paper is called “tatoushi”. Tatoushi is made of washi (Japanese paper). It has an excellent ventilation capability and absorbs and releases excess moisture from kimono. So it is said to prevent kimono from getting moldy. Papers other than washi are poor in ventilation capability, so it is not suitable for wrapping kimono. On the other hand, some suggest that kimono can be easily infested with bugs when they are wrapped with tatoushi. So there are people who claim it is better not to wrap kimono with tatoushi if you are keeping kimono in a chest made of paulownia wood which is great in humidity control. However, it is easier when kimono are wrapped in tatoushi considering the trouble of taking kimono in and out of the chest. 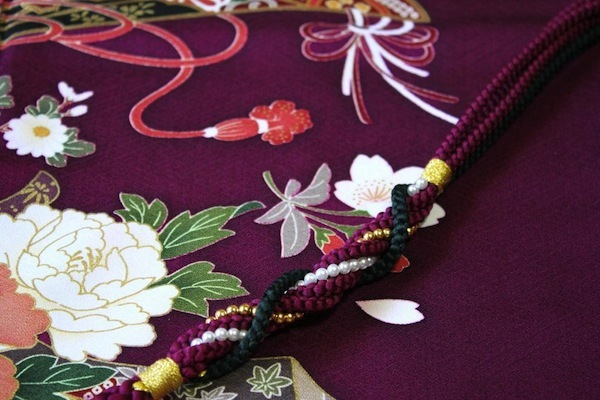 In general, when you buy a new kimono or send kimono for washing or treatment, these kimono will be sent to the place wrapped in new tatoushi. Using this tatoushi will answer the purpose for the time being. Also, cardboards are sometimes used to prevent kimono from losing its shape. But it is just a paper that absorbs humidity easily unlike Japanese papers. So you need to remove it right away. Leaving it will cause molds to infest. There are 2 ways to wash kimono, maruarai and araihari. Maruarai is just like dry cleaning as it is called for normal clothes. Kimono are washed as they are using special washing agents. Its drawback is that it is hard to remove water-soluble dirt such as sweat, but you can remove stains or dirt in a relatively short time and inexpensively. When you say you are going to send kimono for washing, it usually means maruarai. Araihari is a traditional way of washing kimono. First, you unsew kimono and wash with water. You will then make kimono again from the scratch. Because water washed kimono are dried as they are stretched on a board, it is called araihari (wash-and-stretch). It takes time to unsew and remake kimono from scratch, and it also costs more. But this method will remove stains and dirt which cannot be removed with maruarai method. If it is your precious kimono, you should consider araihari after light stains and dirt do not seem to go off with maruarai. Until the early Showa period, there was a custom of doing araihari in each family. Everyone unsewed and then remade kimono. Now, we almost never do araihari at home. However, there are still surprisingly many people who can make kimono from scratch after washing, using techniques they learned back in the days. The are many words in Japanese that describe colors – for example, among the names for different shades of red, we have “hiiro” – scarlet, “akaneiro” – madder red, and “enjiiro” – dark red, and many, many others. There is a trend to use these names to describe colors because they sound “cooler” than standard colors, but they also help accurately describe the actual colors that are hard to convey otherwise. 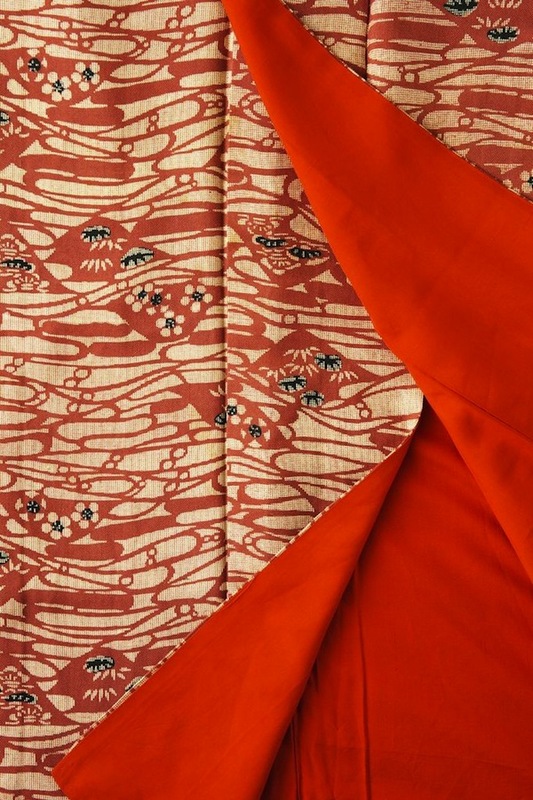 There is also a theory that says that back when color charts weren’t in use, they helped decide the color of a kimono. Even now you can see the Japanese names for colors displayed alongside photos of items displayed in online shops, as sometimes the pictured color seen on a computer screen can differ slightly from the actual one. Some of Japanese colors are registered in JIS (Japan Industrial Standards) as common color names. Furthermore, aside from that, there is an organization whose name roughly translates to “Research Institute for Japanese colors” that makes decisions about guidelines and such regarding colors in Japan. They picked colors that are considered traditional to Japan. For example, one of the colors mentioned previously, “hiiro”, isn’t listed in JIS, but “benihi” is registered as “a vivid, yellowish red”, “akaneiro” is quoted as “deep red”, and “enjiiro” as “strong red”. 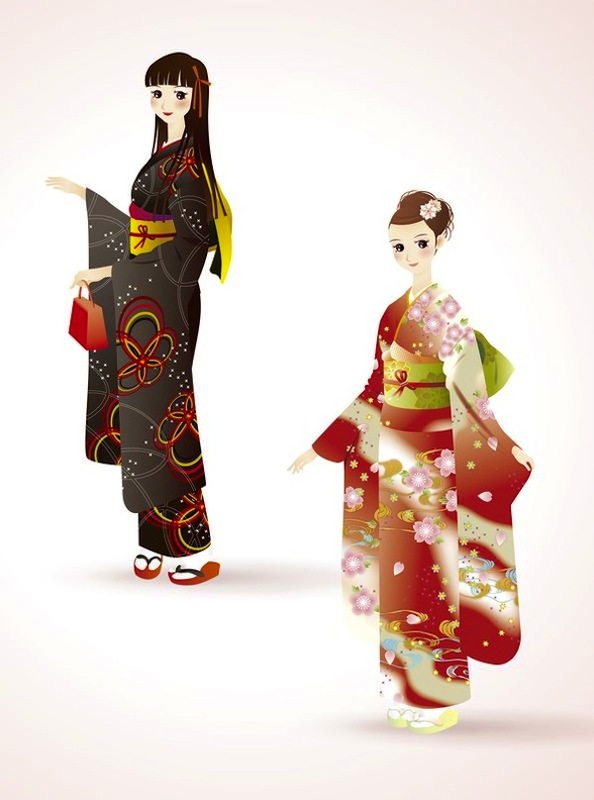 Kimono for children has also the same shape as the kimono for adult basically. However, since the useless cloth comes out in the same kimono making for adult, we have devised a way of cutting. Special kimono for children called “Hitotumi” or “Yotsumi” can be made depending on the difference in this cutting method. 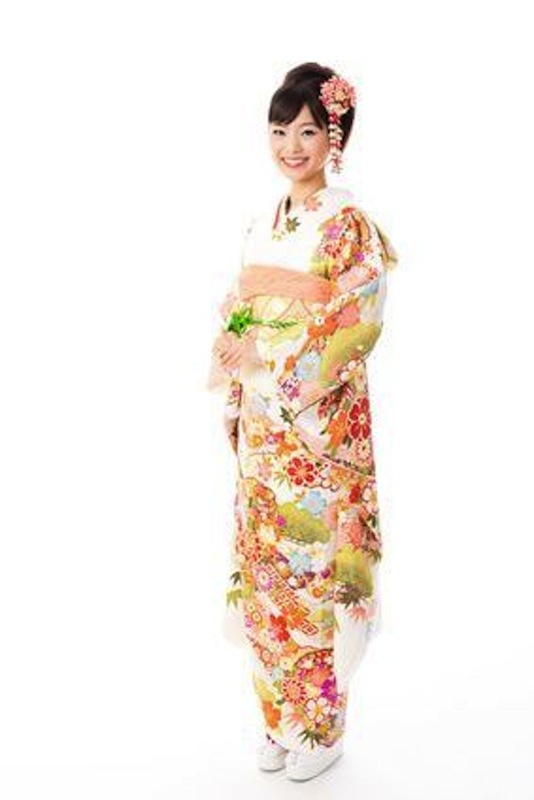 The kimono for adults is called “Hondachi”. 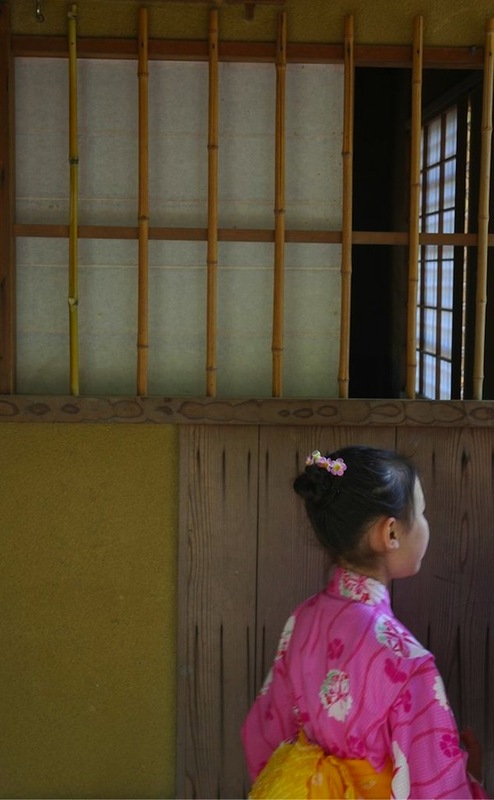 Because children grow fast, we make kimono slightly bigger in “Hitotumi” and “Yotsumi”. Children wear “Hitotumi” and “Yotsumi” which sew darts in part of the waist and the shoulder. The part sewing darts and sewing darts are called “Kataage” and “Koshiage”. You make darts at “Koshiage” and “Kataage” narrow little by little every time kimono becomes smaller. You can wear with just the right size without retailoring. Children around 3 years old or less wear Hitotumi, children from 3 years old to around 10 years old wear Yotsumi, children over around 10 years old wear Hondacchi with Kataage and Koshiage, and children over 13 years old wear Hondachi without Kataage and Koshiage. Kimono which 3 years old children wear on top of the komono in the Seven-Five-Three Festival is called “Hifu”, that is, the overcoat. It is not necessary for them to wear it, but the heavy band is not required because the band part is hided in the overcoat and the burden on the child becomes lighter. The Hifu has become typically used today. “Sechushin (middle of the back) and Wakinui (side seam) are terms frequently used at Kimono making and wearing. Sechusin is the straight stitch from the top to bottom on the back of a Kimono. To wear a Kimono beautifully, the stitch should looks straight in the middle of your back. 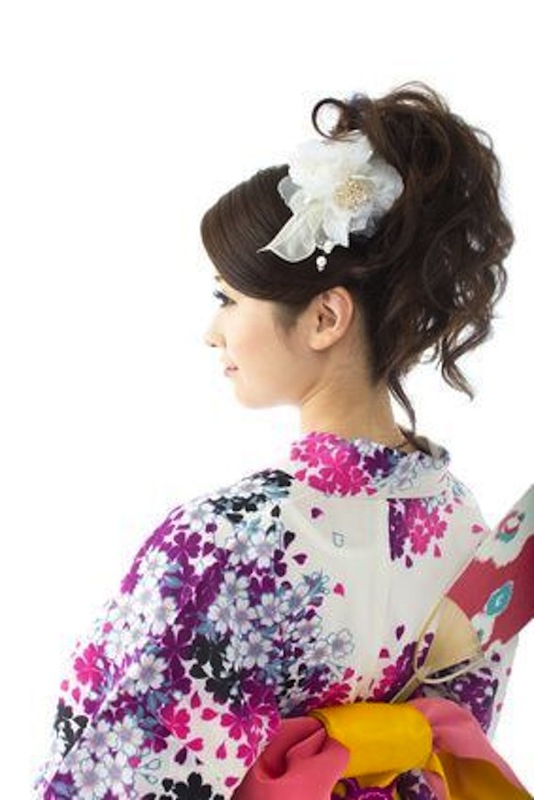 If the size of the Kimono does not fit you, the stitch under the lower back would not appear in the middle of your body, but this is acceptable. However, in this case, you still have to make sure that the stitch is not on a slant. Wakinui is a term used for western clothing as well, and means the seams between the front and back bodies of a garment. Above the lower back, Wakinui should fit to the side of wearer’s body, but under the lower back, they do not have to be exactly on the line. When you make a Kimono from a cloth, there would be some surplus width on the cloth, and it should be hidden inside as a margin for a seam. Because of the hidden cloth, a small Kimono often can be made wider, by undoing Wakinui and sewing it again. A large Kimono also can be made smaller in the same way. Although it is difficult to resizing an authentic Kimono, some resize Yukata (casual summer Kimono) by themselves. When you make a kimono, techniques to make a kimono and obi are called the Japanese dressmaking. It is distinguished from the dressmaking to make clothes and accessories. A tool for use is different in the Japanese dressmaking and dressmaking. The biggest difference is that you do not use a sewing machine in the Japanese dressmaking. Since there is a habit of re-tailoring by unraveling many times, sewing by a sewing machine, which leaves needle holes, has been avoided even now. Because a kimono such as yukata is not used for a long time by making over, however, it is usually sewed by a machine for the cost down. In case that you sew your own clothes, you can sew using a sewing machine on the assumption that it will not be re-tailored because hand-sewing is hard. You need knowledge of the Japanese dressmaking because you cut a fabric with a mark at a position that is indexed in the calculation without a paper pattern originally. The paper pattern of the yukata is available. You can make a yukata or kimono for summer only knowledge and skills of dressmaking if you can use the pattern. A way of making kimono varies slightly depending on the paper, but it is basically all straight sewing. I think that it is easier than it looks because attachment such as a button also does not need. Only making around the collar is a little difficult, but you should do your best since the degree of completion improves if it is made neatly.